Which Corvettes are Considered the Best of the Worst? You are here: Home / Corvette Information / Which Corvettes are Considered the Best of the Worst? That said, we will freely admit Corvette enthusiasts are biased, you may like just your Corvette, the Corvette brand, just one particular class of Corvettes, or every Corvette model that’s ever been built. But that doesn’t mean there weren’t some ugly ducklings along the way. Some versions, shall we say, models that didn’t quite live up to the hype? Keep in mind, when we say ugly, we don’t necessarily mean the way they were styled, or how they looked at the curb. Ugly in some cases meant the power plant they were given as well. We will be creating a list of what we consider to be the “Best of the Worst”. They will be listed in no particular order, so no Top 10 countdowns or anything of the like. We also realize that not everyone will agree with us, or you might have your own versions you want to add. One man’s Venus is another’s Medusa, if you will. We get that, so feel free to comment below. The first “dog” on our list, made the cut due to a weak power plant. During the 1970s, the age of muscle cars was dying out, gas prices were causing most Americans to forgo a love affair with raw power in favor of vehicles that were sensible. This hit the Corvette hard, maybe harder than any other line of cars in the American arsenal. 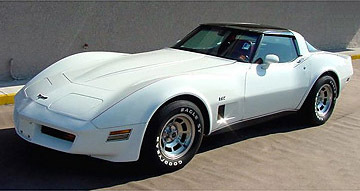 The worst of these was the 1980 Corvette – California edition. The federal emissions requirements were bad enough, but California took it to a whole new level. The standard 350 cu. in. smallblock got replaced in this version with a 305 cu. in. powerplant (and that’s being gracious) that put out a whopping 180hp. Yep, 180, no typos here. If you bought this car, kudos, but seriously, you’re a candidate for an engine swap at this point. We’ll call that the first on the list, but sadly it won’t be the last. We won’t inundate you with all of ours in a single list. We don’t think that’s fair, so we’ll spread the pain out a bit over a few posts, so stay tuned.